I love Count Vertigo. Have ever since he debuted in World’s Finest Comics back in the late 70s. It’s not his powers that make me a fan, it’s his attitude, his belief that his heritage gives him rights over lesser people, and the fact that his home country, Vlatava, can be used to make interesting stories playing on events in the ever-transforming Eastern Europe. So I was less than enthused with the New 52 version of the character, which shed everything except his vertiginous abilities. I approached the latest issue of Green Arrow with both fear and excitement. Count Vertigo was back! But which one would it be? Well, I am very pleased to announce that this is the real deal. Verner gets free of prison, and is already making life difficult for Green Arrow. We learn that he has been in solitary confinement for an extended period of time, but he put that to good use, developing his powers, expanding their scope. He was always a difficult opponent for Green Arrow, and now even moreso. Plus, not wanting to let significant events pass without working them in, the new writers of the book have given the Count a reason to hate Roy Harper, to want vengeance against him, and to demand that he show up to face him. But oops, Roy is dead. And Green Arrow is still coping with that wound. An excellent first issue for Kelly and Lanzing. I have only one quibble. It’s not a big one. But it’s one that somehow just keeps going on and on. In this story, Black Canary does not seem to know who Count Vertigo is. As if they had never faced each other before. But guess who Count Vertigo faced in his very first outing, back in World’s Finest? Black Canary. 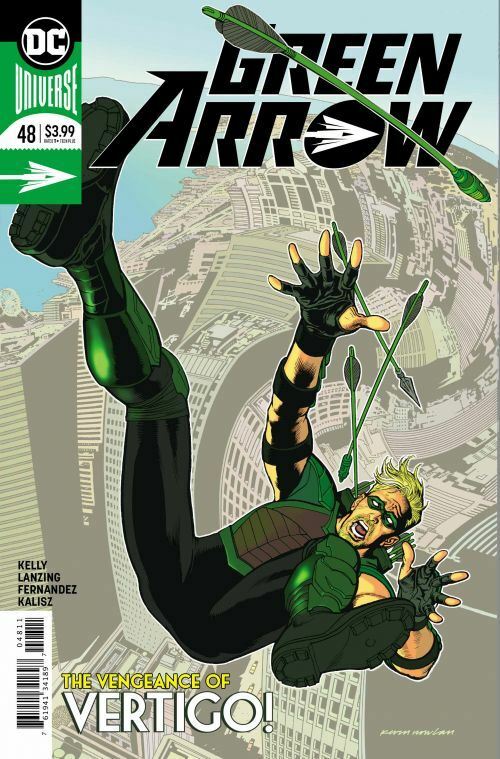 Yes, he has become a Green Arrow foe, but he began as a Black Canary one. At least let her have a past with him! But that’s the one and only thing I can complain about with this story, and I fully admit to it being a niggly fanboy thing. So for everyone else who isn’t such a nerd about things, you should have a ball reading it.